After a very wet March, April provided some needed sunshine and great conditions for photography. 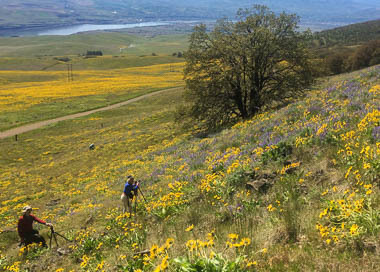 All the rain and then sun added to a spectacular display of wildflowers in the Columbia Hills and surrounding areas. 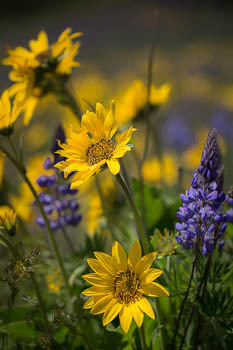 Of particular beauty was the Arrowleaf Balsamroot and Lupine blooming concurrently. 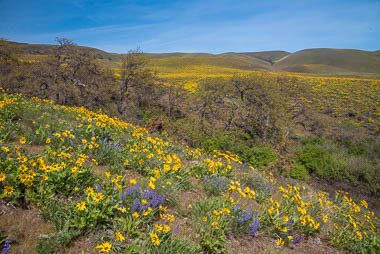 Under blue skies with some cirrus clouds, we headed directly to Columbia Hills State Park in Washington state, and drove up the lumpy road to the small parking area above the Dalles Mt. Ranch. The oak trees were just starting to leaf out, adding a nice warm color to the opulent flower display. 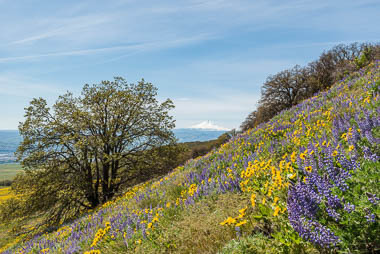 We moved to a lower area in late morning, where there were different groupings of flowers and trees. 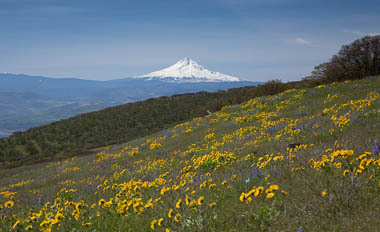 This area also has some nice views of the flower covered Columbia Hills, the Columbia River and Mt. Hood. 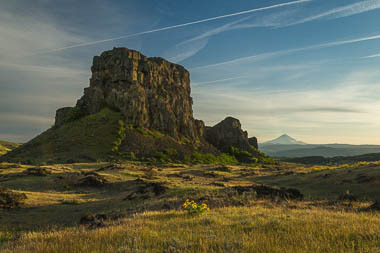 After a very fine lunch at the Baldwin Saloon in The Dalles, we visited the beautiful Horsethief Butte State Park, which adjoins Columbia Hills. 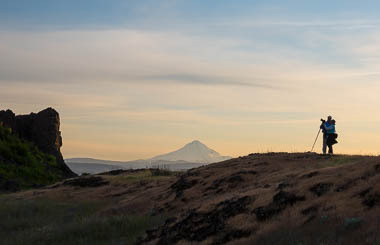 There are many subjects to choose from here, with some added clouds and lovely light on the Columbia near sunset. Even the contrails looked pretty good. We also had a nice ring around the sun through the cirrus clouds.